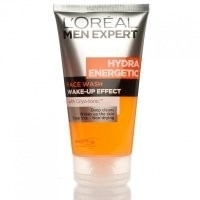 L'Oréal Men Expert Hydra Energetic Cleansing Gel is enriched with Cryo-tonic, the formula wakes up the skin without drying it out. Find it difficult to wake up your skin? Sometimes soap can tighten and dry out your skin. Hydra Energetic foaming cleansing gel cleanses, purifies and wakes up the look of skin without drying it out, in 2 actions. - Active Defence System, a powerful soothing active ingredient, helps reinforce the skin's natural resistance against daily aggressions for less irritation, less tightness and more comfort. Wet your skin with warm water and apply the exfoliating gel over your face, massage and rinse. Use morning and evening for fresher feeling skin all day long. Avoid contact with the eye area. Aqua/Water, Alcohol Denat, Glycerin, Isohexadecane, Hydrogenated Polyisobutene, Cyclopentasiloxane, Ammonium Polyacryloyldimethyl Taurate, Cetearyl Ethyihexanqate, Polymethyl Methacrylate, Hdi/Triethyl Hexyllactone Crosspolymer, Peg/Ppg-18/18 Dimethicone, Caffeine, Isopropyl Myristate, Ascorbyl Glucoside, Mentha Piperita / Peppermint Leaf Extract, Menthol, Sodium Citrate, Triethanolamine, Chlorphenesin, Methylparaben, Propylparaben, Butylparaben, Ethylparaben, Cl 42090 / Blue 1, Cl 19140 / Yellow 5, Parfum / Fragrance, Limonene, Linalool, Hydroxyisohexyl 3-Cyclohexene Carboxaldehyoe. I bought this for my son on request and he loves it. It wakes up his skin and is nice and refreshing on the skin but also leaves it feeling good and not tight at all. It is a little more expensive than some other mens face washes but worth it in my opinion. Loreal tend to change these products quite quickly so sometimes you can't get the same one again. A nice product to use. Great scent and a very male feel to the product (and the product range). There isn't anything especially different about it but it works well with the others in the range and it works well pre-shave. "I bought this for my son on request and he loves it. It wakes up his skin and is nice and refreshing on the skin..."